It's hard to imagine now, being a homeowner and proud father of two, that there ever was a time when it could seem so important to drop everything, drive seven hours through three states and stay overnight, just for the chance to visit a shopping mall where a movie was once filmed. But believe it or not, there was. The time was January 2001. 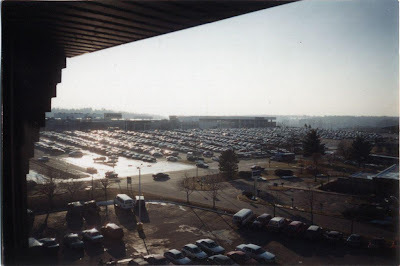 Having been a rabid fan of George Romero's Dawn of the Dead for more than a decade, I had long been toying with the idea of driving from Brooklyn out to the suburbs of Pittsburgh on a pilgrimage to the Monroeville Mall, where the most famous cinematic zombie infestation of all time had taken place. But it also seemed too far away. It would require an overnight stay, and that just seemed like going a bit too indulge a geeky whim. Having been married close to two years, my wife and I had made the decision that in 2001 we would try to have our first child. Pondering the onset of this life-changing event, I knew that a day was drawing nigh when the instant indulgement of a whim would become a thing of the past. Our lives would need to be dedicated to building our family like sensible adults, and so the getting out of any ya-yas would have to take place now, or never. What the hell, I thought. Let's do it. As a concession to my wife and her saint-level patience--as well as a method of enticing her to agree to the trip--I decided that on the way back from Monroeville, we would stay overnight at a bed and breakfast in the beautiful historic section of Pittsburgh (no, I didn't know it had one either). So we jumped in the Honda and headed west for a frivolous weekend of paying homage to a horror classic. And now, all these years later, thanks to the progress of modern technology, I can share it with the world. So close, yet so far away. This was the tantalizing view of the Monroeville Mall from the window of our hotel room across the road. Possibly similar to the view of Tom Savini's evil biker gang before they invaded. My photographic tribute to one of the film's iconic shots, taken in the parking lot. 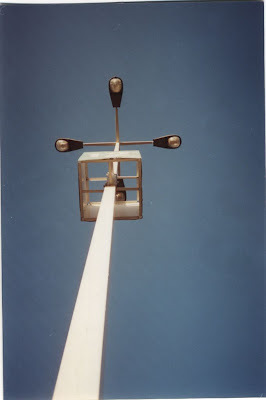 Thankfully, the lightposts were among the few things that remained unchanged. I thought about leaving this one out, but it was just too damn cool. So you'll just have to excuse the awful tucked-in shirt. After locating and sneaking into this access passageway under the nose of a security guard, I proudly took this shot before getting kind of creeped out and leaving. 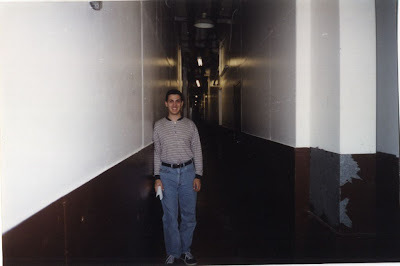 You'll recognize it as the secret hall that led to the survivors' upstairs living quarters, which was overrun by zombies in the climax of the movie. In reality, there's no stairway--it just leads to the backdoors of a bunch of mall stores. 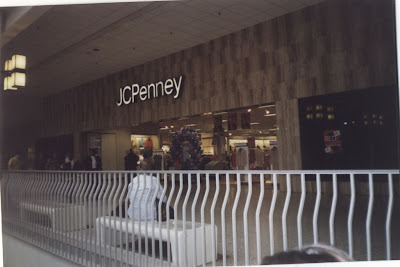 The entrance to Penney's, where our heroes fumbled for their keys and fought off the zombie hordes with a blowtorch. Also where some of the climactic zombie chow-down was shot. Note the updated store sign. I've got plenty more to share, but that'll have to wait for another time. God bless the internet! Great story. And you're a lucky guy if your wife is willing to indulge you like that. Love the shot of the light post too. Hell yeah dude. I got to see the same place during last year's zombie walk. It's funny how different the mall is, and it was really bizarre to have the actor who played Rhodes screaming down from the second floor at a massive crowd of zombies. Gord: Yes, I am lucky. I realize that these days more than ever. And don't worry, there's more of the story yet to come! I just didn't want to post all the pix at once. Charlie: I'm jealous! I heard about that zombie walk--would've loved to have been there. Outstanding. I made my own pilgrimage just a few months after you (only partially documented at http://www.laze.net/dead/ which I sadly never completed). laze, did you not finish the pilgrimage, or did you not finish writing about it? Those side by side shot comparisons are awesome. I finished, but I didn't get to post the Monroeville Mall photos... part of the problem was that I took a lot and had to match them up with the map of the mall I'd marked up so I could do before-and-after shots. But the main issue was that at that point, I only had a film camera with me (had just lost my digital) and so it required manual scanning of them all. I got lazy/busy. You'll also want to check out http://www.fanofthedead.com/ - a new documentary by a French fan where he travels to the US and visits the sites of Night, Dawn, Day, and Night '90. I've been meaning to check out that film since I heard about a couple weeks back, but it slipped my mind until you reminded me again. Thanks! The Wig: Evil Hair. Yawn. "My Name Is Bruce" Update! Will We See More Than Jason's Sack? 30 Days Sequel: DTV or Not DTV? Who Wants to Be a Scream Queen?